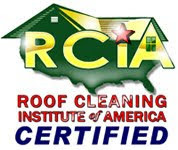 Removing Roof Stains-Louisville-Kentucky: So you think you want to clean your roof yourself? So you think you want to clean your roof yourself? If you've got the idea in your head that you going to engage in some diy roof cleaning then first you should get your head checked. No, I'm not joking. There are so many things that could go wrong while cleaning a roof if you don't know what you're doing, not the least of which is the possibility of paralysis or death. That said, if you really don't want to hire a roof cleaning specialist and are determined to go for it despite the risks then allow me to recommend a short list of necessary roof cleaning equipment. 1. Let's start with the safety equipment since that is the most important aspect. If possible use a non-conducting ladder just in case it touches a power line. Use a ladder stand-off to provide stabilization. If at all possible use a safety harness system to eliminate the chance of a fatal fall. Wear gloves, a mask, long pants, and goggles to protect your skin, eyes, and lungs from the roof cleaning chemicals. Also make sure to have a buddy helping you out just in case you need help or have a nasty fall. Finally, invest in some cougar paws for better traction on the roof surface. Chemical-covered or water-soaked shingles are EXTREMELY SLIPPERY, so you better be prepared for that if you don't want to seriously injure yourself. 2. As for the chemical delivery system you'll need a large poly tank, 200 feet of poly hose, a hose reel, a battery powered and chemical resistant pump, and a chemical resistant trigger gun and set of spray tips. Plumb the tank with the hose, connect the hose to the pump, attach the gun to the far end of the hose, and you're ready to rock. No pressure washer required! 3. Rinsing equipment is pretty simple: you'll just need a few garden hoses and reels. I prefer 100' non-kink hoses but go with whatever makes you comfortable. Or you may want to let "Mother Nature" do it for you. She does a better job anyhow. 4. Other miscellaneous items that would be good to have include a long-bed pickup truck or trailer, a ladder rack, a cooler full of icey water, sunblock, a first aid kit, and an extra set of shirts and shoes. 5. You are gonna need one of your buddies to help you, by keeping all the plants and landscaping wet should any of the chemical get on them. He will probably work cheap. A steak dinner and a couple of beers. No problem. So there you have it, fellow roof-hopping weekend warriors. It is dangerous and difficult work so please have a plan and be careful if you'll be doing some roof cleaning this weekend. If you're thinking that all this stuff sounds very expensive and hard to find, well, you're absolutely right. It will take you awhile to pull all this gear together and the final price tag will probably make you want to cry, especially when you consider that it's for a one-and-done home improvement project. Do yourself a huge favor by scrapping your DIY plans, hiring a professional non-pressure cleaning service, and leaving the roof cleaning equipment purchases to somebody else.